This chicken and vegetable soup recipe is quick, super simple, gets rid of lots of leftover vegetables and tastes great. It also uses ingredients that are in season right now, meaning the health benefits are boosted. As with many soups, it’s basically a one-pot recipe so is low effort cooking. The method is really simple. Fry the bacon in a soup pan with the onions. Chop the vegetables and add to the pan. Add the chicken stock and bring to the boil. When the stock and vegetables are boiling, add the chicken breasts to the top of the pan and cover. Reduce to a simmer and wait for the chicken to soften (about 20-30 minutes). When the chicken is cooked, remove from the pan and shred with two forks. 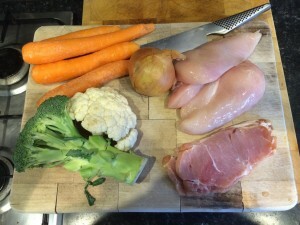 Add the stock, bacon and vegetables to the blender and whizz to the desired consistency. Add the chicken back to the soup, warm through and eat. It’s that simple – an amazing chicken and bacon soup. It tastes good and is so healthy. Way better than the crap you can buy in a tin, and it’s full of fresh vegetables! It’s also a way to avoid massive food wastage – even if the vegetables are a little past their best, you would barely notice in something like this. It’s the vegetable equivalent of recycling stale bread to use as breadcrumbs or croutons. If you like the idea of shredded chicken, check out this recipe. 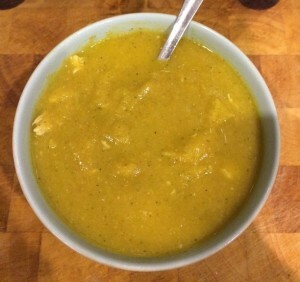 I borrowed the technique for this chicken and vegetable soup.